• For use on single-wall flue pipe only. • Place thermometer 12 inches above top of the stove. 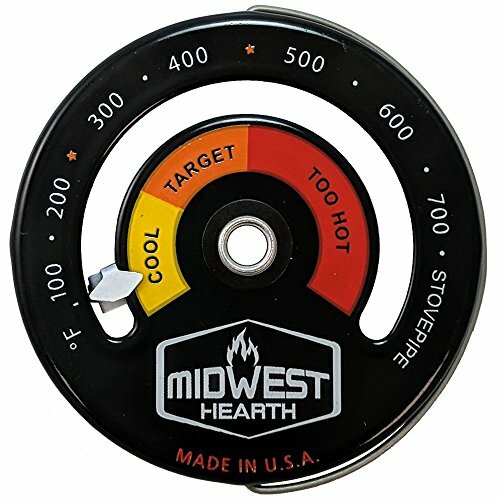 • Attach to the stove pipe using the magnet on the back side of the thermometer. • The best operating temperature for most wood stoves is between 230°F and 475°F and is illustrated as the middle zone on your thermometer labelled "BEST ZONE". • Temperatures below 230°F can create a dirty, smoky fire that leads to creosote buildup in your chimney. Creosote can be a safety hazard. This temperature range is illustrated on your thermometer and labelled "CREOSOTE". • A temperature above 475°F consumes more wood without additional room heat as more energy is lost up the stove pipe. This area is illustrated on your thermometer as "TOO HOT". FOR SINGLE WALL STOVE PIPE - Calibrated to read temperature on single wall chimney flue pipe. MAGNETIC ATTACHMENT - Easily attach to your metal chimney pipe. Magnet will hold to 800°F. EASY TO READ ZONES - Optimize efficiency, prevent overheating, minimize creosote. PORCELAIN ENAMEL FINISH - Premium quality finish to compliment your beautiful stove. FLIP UP HANDLE - Quickly remove or reposition meter with built-in handle.